After mining through dozens of recipes, I've decided to post a choose-your-own-filling (with a spicy flare!) 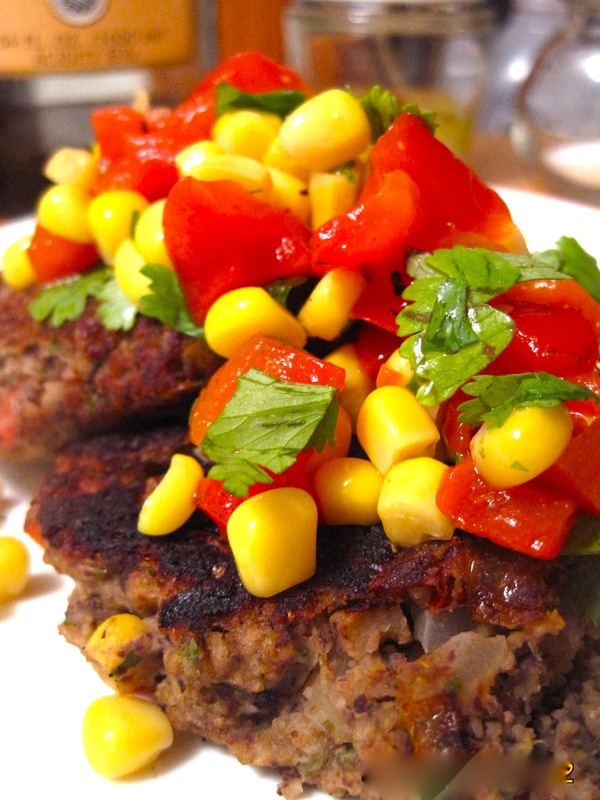 recipe for these Southwest Black Bean Burgers. I'm giving so much leeway in this recipe because you basically can't go wrong with the classic Southwestern combo of black beans, onions, pepper, corn, and chile; despite the existence of so many variations on this dish. Mushrooms are optional to create a more "meaty" burger-like consistency, but without them the texture of these burgers are still pretty firm- they even resemble the coloring of a medium cooked hamburger both inside and out! It's easy to forget you are eating vegetarian here. Speaking of, feel free to pile on the veggies: I've seen shredded carrots, beets, and radishes all added to the batter. Vegetables do tend to retain water though, so just make sure your patty consistency remains thick enough to stick together by balancing it out with the right amount of beans, egg and breadcrumbs to hold together. Conversely, stay in the Southwest theme by substituting crushed tortilla chips for breadcrumbs. Consider adobe chile, chopped jalapenos or cayenne pepper to create spice..adjust amounts accordingly depending on your gringo tolerance! These burgers incorporate just about everything I can kvell about in a recipe. They are super healthy, filling, tasty, easy, quick, you can freeze the batter for later use, and the ingredients are cheap. I recommend topping with salsa, fat-free sour cream or yogurt, and avocado slices, and serving with a side of Baked Sweet Potato Fries, or serve mini patties hors d'oeuvre style with a dollop of salsa on top of each bite. 1. Warm 1 tsp oil in a skillet on medium-high heat. Add onions and cook for 3 minutes, stirring often. Add spices (if using), garlic, serrano chile, peppers, and optional veggies, and cook for a 5 more minutes. 2. While the vegetables cook, combine beans, corn, chipotle (if using), adobo liquid, cilantro, and lime/orange juice in a food processor or mash by hand in a large mixing bowl. Fold in cooked veggies (if liquidy, cook uncovered until vegetable liquid evaporates), egg, and bread crumbs/tortilla chips, and mix together. Season with salt and pepper. 3. To pan-saute: Heat 1 tsp oil in pan over medium heat. Pour batter (1/2 cup for large patties, 1/4 cup for hors d'oeuvre sized) and cook until browned on both sides, flipping once, about 8 minutes total. To bake: Preheat oven to 375 degrees. Form burgers on a lightly-oiled baking sheet, and cook for 25 minutes, until firm and lightly crusted. 4. Serve warm with toppings of your choice.